TV Guide called Seinfeld the best TV show of all time in 2002. Debatable as that claim may be, the show did unequivocally define part of the 90s TV landscape and leave a lasting impression with audiences. But as the story goes, “Seinfeld” almost died in its first year on the air. TV is a cutthroat business and there’s tremendous pressure for new, or fledgling, shows to build audience and draw advertising dollars fast. No studio or network wants to carry the “overhead” and red ink of an under-performing show. That’s especially true today in a time when Internet technologies, gaming and other pastimes are expanding the options and access we have for amusements. Every tool in the marketers arsenal is fair game – even releasing premiers ahead of their formal broadcast debuts. For Hulu, a video website jointly owned by News Corp (Fox) and NBC (along with ten percent to private equity partner Providence Equity), that’s good news. The site announced today on their blog that they’ll be hosting the world premieres of five shows – Knight Rider, Lipstick Jungle, Chuck, Life and 30 Rock. And by “World Premier” they mean it. The shows will air before being shown on broadcast TV. For NBC, the plan seems to be one part marketing (pre-air hype generation) and one part anti- piracy prophylactic. Online premieres may be relatively new but they borrow from the time tested practice of advance screenings. In the movie industry, for example, marketers often release smaller films in “limited release” to build word of mouth interest and fuel "viral marketing." Later, as buzz develops and audience interest rises, the display footprint expands to more theaters. NBC added the online equivalent to their marketing toolbox last year. 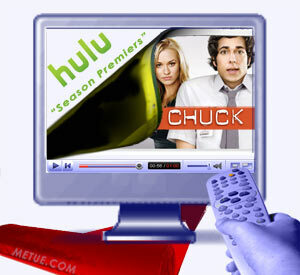 Several shows including Chuck, Life and the now canceled Bionic Woman and Journeyman premiered in a similar fashion to what they’re doing today with Hulu. Cable staple, Discovery Communications, which has shown a particular desire to build crossover (web-tv) audiences through their acquisitions of How Stuff Works and Treehugger, has also tested the practice. They used online pre-air premiers as a marketing tactic in August 2007. By ratings, it’s not clear if any of these efforts help drive first-episode TV viewership but they don’t likely hurt either. File sharing of popular, or anticipated, TV shows has become increasingly common. In June, Wired reported that the pilot for JJ Abram’s upcoming (Sept. 9 debut) Fox thriller “Fringe” was online and trading several months ahead of scheduled release. HBO’s upcoming (Sept 7) “True Blood” found a similar online following. Some believe the networks themselves “seed” some of this content to increase the chatter about their programs and build demand. Other’s believe the online footage is more nefarious and was stolen/pirated. In addition to the five premiers, over the coming month, Hulu will be offering a selection of other programs premiers, some aired on a similar schedule to broadcast, other’s following a slight delay. Check Hulu for precise scheduling.